MOON TOWNSHIP– Robert Morris softball (13-28, 4-4 NEC) concluded their eight-game game homestand with a split in a doubleheader this Saturday against NEC rival Wagner (12-21, 2-4 NEC). This series featured the Colonials doing what they have been doing almost all season, which is playing two completely different games. They won the first game 10-1 but fell in game two by a score of 11-1. Aside from an RBI single from Alexis Silinonte, the Colonial defense was on top of things in the first game. Dana Vatakis was in the circle for RMU and pitched the entire game, posting a solid performance and only walking one Wagner batter and striking out three. The Colonials offense fired back and picked apart the Seahawks, putting up 10 unanswered runs. Taylor Bartlow had an RBI home run in the 3rd inning for her second home run of the year. The Colonials then went on to add six more runs on five hits in the 4th inning as they took advantage of the Seahawks struggling fielding and pitching. Taryn Miller added another two-run home run for RMU and the Colonials walked away from this one with a win 10-1 after only five innings. As for the second game, the Colonials and Seahawks seemed to have switched positions. After a slow start from RMU which allowed Wagner to score three runs, Abrielle McCartney gave RMU some hope as she clobbered a home run to make the score 3-1. Wagner did not take their foot off the gas pedal as they piled on the runs. Kaila Smith, Jessica Carlucci and Karen Prihoda all hit home runs for the Seahawks. The Colonials struggled defensively and replaced pitcher Laura Coulter with Dana Vatakis, who pitched the first game. Vatakis wasn’t able to stop the bleeding though. 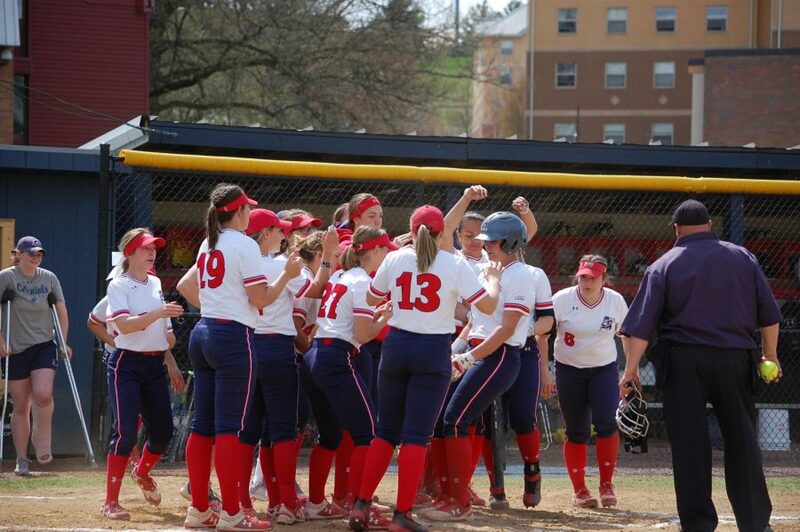 RMU went on to lose the game in only the fifth inning 11-1 to have yet another split in a doubleheader. This is the fifth straight doubleheader that the Colonials have split, with this one coming to an NEC opponent. When asked about his team’s consistency to split doubleheaders, coach Jexx Varner had the following to say. Up next, the Colonials are on the road for the next three doubleheaders. The first of which is a nonconference game at Kent State this upcoming Wednesday at 2:00 pm where the Colonials will look to win both games of a doubleheader.